Speaking with TMI at his Miami-based office, Graziani said that the name change was just the final piece of a complex picture, the culmination of a 15-month long, in-depth effort to inherently change the culture of the company. “The brand was ready to be launched much earlier than when we announced it, in February or March, but we didn’t want to launch a brand until we were ready internally. If we were telling the world that we are a certain kind of company, we needed to behave that way internally. And before we were talking about the change I wanted us to walk the talk,” he said. The rebranding reflects a significant change in the culture of the company, said Graziani, whose strong travel retail background includes 11 years heading up Nuance until it was sold to Dufry in 2014, and then 3 years as President of Shilla Group’s travel retail business. “The company was a little too short-term oriented. We thought that we needed to have a more strategic approach – and sometimes a strategic approach can limit your short term opportunities, so this is a significant change,” he said. The transformation process started as soon as Graziani arrived in July 2017, he tells TMI, an effort that first entailed understanding how the company was perceived, both internally and externally. “We had very lengthy discussions with our partners asking them how they perceived us: what were our strengths, weaknesses, opportunities, challenges? We asked the same of our employees, and in the end we had quite a good understanding of how we are perceived. “Starting from that we understood what we had to improve, what we should have leveraged better, and where we were strong. From there we have completely redefined our mission, vision, and strategic objectives starting the process from our values. I believe everything starts from your values,” he emphasizes. What was the most surprising result of this analysis? Graziani says the most surprising result to him was to realize that the company’s stakeholders were not surprised about the change. 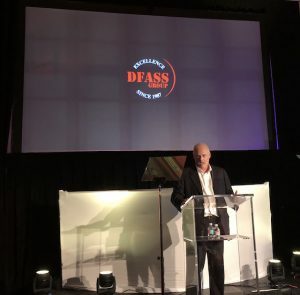 “They were giving us probably a lot of credit and they knew that when it was needed, DFASS would be able to reinvent itself as it has done in the past. This is what surprised me the most,” he noted. In order to change the culture of the company, Graziani said it was also necessary to inject some new people with different skills and backgrounds. As a result, 3Sixty’s current executive team is mainly comprised of people who have been with the company less than 2 years. 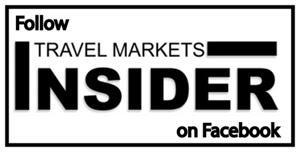 “We have been focused on hiring quite a lot of professionals and we were able to get senior executives from top companies in the Travel Retail industry, creating a very strong mix of competencies and cultures,” he says. together with those already in the company. The team is now ready to play its role in the industry and even beyond it. Today we compete with big companies in the broad online marketplace and we need to find our niche where we can have a competitive advantage vis a vis them, to make sure we are not going to fight with someone against whom you cannot win. Having the right mix of knowledge and competencies was, therefore, paramount for us,” he explains. 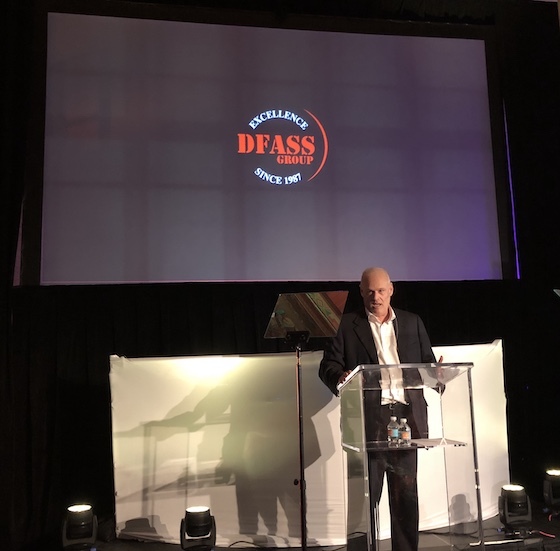 During the big reveal event in Miami last October, Chairman and company founder Bernard “Benny” Klepach presented background on how the DFASS company had evolved over the past 31 years. He was followed by Executive Vice chairman Roberto Graziani, shown here at the moment of the unveiling of the new 3Sixty Duty Free & More rebranding. So how does Graziani define 3Sixty as a company? “That is a very easy answer. We are 3Sixty and we want to be recognized as the operator that can offer opportunities at 360 degrees in our industry. We have invested quite a lot in our ground store business and as a result have increased our ground sales by 40% in the last 24 months. We have added many new shops, with many new concessions, and we want to continue. “At the same time, we want to continue to develop the inflight business with a different perspective, not just relative to selling what we have on the carts. We want to be able to offer the consumer the possibility to pre-order, with on board or home deliveries, and we want to be reconnected to them through the data that we have. “It is a fascinating business and I think we have quite a lot to do,” he concluded. 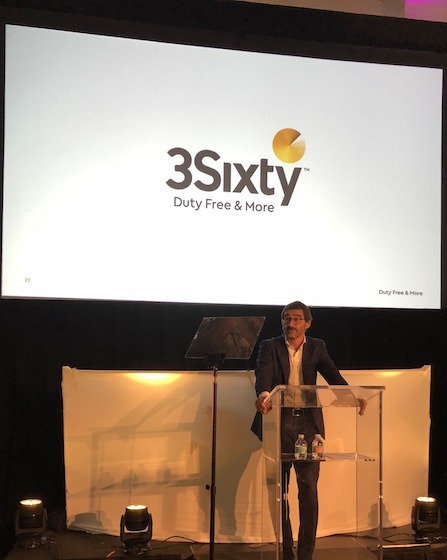 A key element in the 3Sixty rebrand reveal was the announcement of how the company planned to transform its traditional inflight business into an omni-channel, digital powerhouse. 3Sixty Duty Free Executive Vice Chairman Roberto Graziani says that DFASS founder Benny Klepach was the first to understand the value that the inflight business could have some 30 years ago, and now is one of the first to understand the opportunities of transforming the current inflight business into a consumer oriented omni-channel experience. “This is the story of the last months. We are developing this new omni-channel concept that we think will take us to the future,” said Graziani. 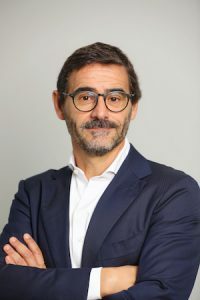 Graziani admits that he was originally reluctant to look at digital sales, but he now believes that the business is evolving and will continue to do so very rapidly. Graziani says that 3Sixty is fully committed to the joint venture it created with Singapore Airlines (SIA) and SATS (Asia’s leading provider of gateway service, ground-handling and food solutions), for which 3Sixty is the exclusive supplier. “We are taking the best technological platform currently present in the Travel Retail business, the OM3 from AOE, and have joined forces with SIA, the major partner in the venture, and SATS to operate as a separate omni-channel business unit. It is quite a big commitment for all the three partners,” he explains. The company will soon begin implementing the new platform, integrating the OM3 into the SIA technological infrastructure and database. The plan is to release the first phase in June, for completion in the following 12 months. Explaining how the system will work, Graziani says that a when a traveler books a flight with Singapore Airlines, KrisShop Private Limited (the JV between 3Sixty, SIA and SATS) will know when and where the passenger is going to fly, and it can offer them the opportunity to see the duty free program when they are booking. KrisShop can also contact passengers at a later time to make them aware of available offers. If the passenger is a previous customer, 3Sixty can personalize the offer specifically according to what was purchased before or on the basis of his/her previous trips (class, destination). The next step, says Graziani, will be to offer the program to other airlines, particularly those in the Star Alliance. “Instead of building their own inflight program they could share our platform and take advantage of what KrisShop is doing,” he said. The program that 3Sixty recently announced with the Avianca Group works quite similarly. Instead of creating a joint venture, as it did with Singapore Airlines, 3Sixty and Avianca have created a Joint Business Agreement (JBA), with shared profitability. One difference with Singapore Airlines is that Avianca serves a huge number of domestic passengers, which Graziani says is an untouched market. From the beginning of the agreement with Avianca, 3Sixty had planned to use its own workforce rather that have crew selling, says Graziani. “We have evidence that our dedicated sellers are able to deliver much higher sales than flight attendants. Even 50 to 60% more. We are constantly reviewing their productivity, flight by flight, and also the costs involved with them. “We have to pay these people a fix salary plus incentives, whereas when you use the crew they are only getting incentives on top of the salary paid by the Airline; then we have to pay for a commercial seat, and the taxes related to the seat, and sometimes we have also to pay overnight accommodations. It is quite expensive,” he said. “When implementing our JBA with Avianca we have decided to introduce a mixed model: we will continue to use our dedicated sellers for the most productive routes while we will go back to the flight attendant model for the routes not delivering enough sales to compensate for the cost of the dedicated sellers,” he noted. Looking ahead, Graziani says some of the sellers may receive safety and environmental training, which would allow them to be seated in crew seats, thus cutting costs significantly. Graziani notes that 3Sixty is discussing testing the direct seller concept on certain Singapore Airlines flights as well. Graziani says that the role of direct sellers/flight attendants with the new omnichannel business model is becoming even more strategic than in the past. “They are technologically equipped and they don’t have just to sell what they have in the cart. They have to become our ambassadors and create an engagement with passengers. They have to show them all the possible alternative instruments they can use to buy and where they can have the goods delivered. Even if they are not able to sell they can create the circumstances for future pre-orders. That’s the reason why training our sales force is another pillar of our omnichannel strategy,” he says. Along these lines, Graziani reports that the company is investing heavily in training modules, as well as technology. “We are trying to leverage the knowledge and the strengths of both of our major partners to build an ever stronger business model. Customer data, technology platform, sales force training and targeted assortment are the key elements to succeed in this business. “You need to offer a very broad range of products and you need to offer something different than the usual duty free programs. You need to add specialty categories and luxury products and you shall always try to match your customer’s needs with a differentiated offer based on destination and passenger profile,” he said. Graziani confirms that 3Sixty is very committed to developing its airport and ground retail business, especially in the Americas. The company currently operates 70 stores in 10 airports in the U.S., Canada, Mexico and Colombia – plus two cruise terminals in Mexico. “We are going to open another two cruise terminals in 2019, one in Mexico and one in Honduras, plus we are going to open our concession in Pittsburgh International Airport, as well as three new stores in Fort Lauderdale, Florida, and another two in Dallas, Texas. The company will also be making some very interesting changes at its award-winning duty free stores in Dallas-Fort Worth International Airport, says Graziani. Over the next 12 months, the company will focus on what it has promised the airlines, opening the new airport and cruise terminal shops, and improving merchandising and shopping in some existing stores. “We shall continue to invest and nurture the new culture we have implemented because it will be the engine of our company. We have to feel and continue to be 3Sixty if we want the stakeholders to look at us as a 360 company,” he concluded. Some of 3Sixty’s duty free and specialty boutiques at Dallas – Fort Worth International Airport will most likely be the first to sport the new name designation, as shown in the rendering.